Introducing 96 Doors of Access Control from DMP Alarms on Vimeo. The XR550 Series access/burglary/fire panel is the most capable panel in the DMP lineup, providing the ability to manage up to 96 doors! You have the option to offer security and access control as a managed service, or you can give your customer complete control. With the XR550’s built-in network communications, customers can monitor and manage their panels from anywhere via VirtualKeypad.com or the DMP Virtual Keypad™ app. Large installations used to require multiple panels, which added cost and complexity. Now even the biggest installations – warehouses, multi-tenant commercial, museums, and industrial buildings – can be managed with a single XR550. Even retail installations, with display-case mag locks and readers, now require just one panel. And the XR550 also solves multi-panel restrictions like anti-passback, as well as managing codes, authorities, and schedules. Doors 1-16 are supported on the standard keypad bus using any of the 734 Wiegand Interface Door Modules. The remaining 17- 80 doors are supported on the five LX bus ports, which transition to Access (AX) buses. The AX bus™ supports both 734 devices and wireless zones; you can mix and match on the same bus. XR550 Version 111 - available for download for dealers, it supports 32 doors out of the box. XR550 32 DR ADD ON A - adds an additional 32 doors of access control for a total of 64 doors in a single XR550. XR550 32 DR ADD ON B - adds another 32 doors for a total of 96 doors. With the update to VirtualKeypad.com, your customers can manage their intrusion, access, video, and automation management systems from a simple and powerful interface on their phone, tablet, or browser. 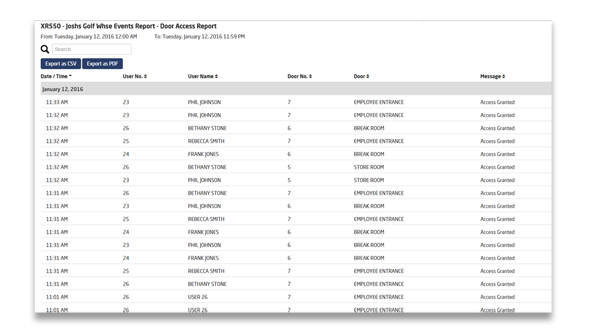 By enabling Advanced Reports in the Dealer Admin site, you can offer your customers real-time access control status with these custom reports via the Virtual Keypad app and VirtualKeypad.com: Door Access, Door Status Events with Access Granted and Denied, and Output Status Events. This gives you a fully featured Cloud-based access control system with no software to install or maintain. Centralized security management for security and access control, all in one XR550 panel that supports 96 doors! The XR550 continues to offer far more for less!